Lee Student Council Visits Spring Initiative! The Lee Student Council made a special trip downtown to visit Spring Initiative! Spring Initiative builds relationships with the youth of our Clarksdale community to ensure that all students have successful educational experiences. 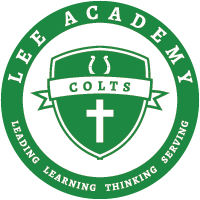 We are excited to announce that the Lee student body raised over $600 to assist Spring with their day-to-day operations. The Colt Community looks forward to strengthening our partnership as they continue to foster growth and positive change in Clarksdale!